The first official week of 2009 ⎯ back to work, openings, and all the rest. It was great to receive a wonderful poem by Rumi from my friend Steve. The poem, translated by Coleman Barks, is entitled Chinese Art and Greek Art. It’s a good read for everyone, but especially for artists. I just loved it, thanks Steve! Also, my friend Lynne, who knows how much I like birds, introduced me to the album, You Are My Little Bird by Elizabeth Mitchell. Although the album is for children, I think adults can enjoy it as well. It has really wonderful interpretations of songs by Bob Marley, Velvet Underground and many others. My favorite song so far is: If You Listen. The album explains that the song was “originally recorded by French singer Francoise Hardy, and is all about how listening can be a magical experience”. I agree…and hope you enjoy them as much as I did! but the Greeks wouldn’t say anything. They don’t study books of philosophical thought. 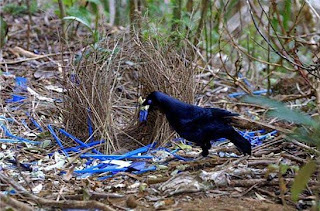 Image: One of my favorite birds, the bowerbird, working on his blue monochrome nest.